What is the Difference Between a Certificate, a License, and a Resume? A certification is like a degree - it proves you studied, passed a test, and knew something - once. A license is a legal document that allows you to practice in certain locations. A resume displays your accomplishments in a particular related field and serves as a testament to your level of competence. So What is Really Required for Sailing? No matter where you are in the world, if you want to prove your current sailing competency, you must have a sailing resume. Every yacht charter/rental company asks you for a sailing resume. If you present a certificate or a license, they will still ask for a resume. Why? Because certificates and licenses do not prove competency. Instead, a sailing resume documents: sailing theory knowledge, total sailing experience detailing positions of crew or master on various vessels, the recent history of experience, and results of on-the-water assessments. A sailing resume also includes any certificates and licenses. From a sailing resume, a determination can easily be made as to the current competence of a person. The RYA can issue a Day Skipper license which is accepted worldwide. The RYA can also issue the International Certificate of Competency (ICC) which was created by the United Nations. NauticEd can issue the Sailing License and Credentials (SLC) which is accepted by all Mediterranean countries and yacht charter companies. No American or Canadian sailing body can issue the ICC as neither country was a signatory to the United Nations Resolution creating the ICC. Instead, Americans and Canadians must rely on either RYA or NauticEd for licensure. The SLC is readily available to USA and Canadian Residents (and other country residents who cannot easily obtain an ICC or Day Skipper) and there is an extensive network of NauticEd sailing schools throughout North America able to offer the practical assessment for the SLC. How Can I Gain an SLC? Once achieved, the SLC is made available instantly in a downloadable PDF in multiple languages. Because the SLC combines assessment, theory, and experience, no additional resume is needed to satisfy charter company requirements. More details on how to gain the NauticEd SLC are here. How Can I Gain an ICC? Pass the RYA Day Skipper certificate. This is a 40 hour online theory course and exam (the NauticEd RYA Day Skipper theory course) plus a 5 day on the water practical training at an approved RYA school. Even with the ICC, the Candidate should keep in mind that a yacht charter company will still require a sailing resume displaying extensive practical sailing experience as the master of the vessel. More details on how to gain the ICC are here. There is an extensive network of RYA schools throughout the world. However, there are only 3 locations in North America - Pensacola, Toronto and Halifax. **The Bareboat Charter Master bundle of courses online are highly recommended as a prerequisite to an ICC assessment. The NauticEd resume is an instant snapshot of the competence of a student. Resume building is simple with NauticEd's software. Your resume is continuously built in the background and presented in real time. You never have to spend time updating your resume because it’s always current and automatically formatted in a manner acceptable to yacht charter companies. NauticEd provides this tool as a FREE service to all its students. You can view our example student, Joseph Sailor, by visiting: http://www.nauticed.org/student_verification and entering his credentials as shown. On this page, a yacht charter company can view your real-time sailing resume when you give them your email address and secret logbook code. There are five Ranks and five Levels in our sailing resume. Levels are dependent on the amount of practical sailing experience a student has logged in their logbook. Qualified Crew Member: Either the Qualified Crew Member Course or the Skipper Course or RYA Day Skipper Course + a minimum of 10 qualifying days on the water (Level I) or shortcut with 4 days and a successful Qualified Crew Member competence assessment by an affiliated NauticEd School assessor. Skipper: Skipper Course (or RYA Day Skipper Course) + Maneuvering Under Power Course + a minimum of qualifying 10 days on the water (Level I) or shortcut with 4 days and a successful Skipper competence assessment by an affiliated NauticEd School assessor. Bareboat Charter Master: Skipper Requirements + Bareboat Charter Course + Coastal Navigation Course + Electronic Navigation Course + Anchoring Course + a minimum of 50 qualifying days on the water (Level III). Captain: Bareboat Charter Master Requirements + Sail Trim + Storm Tactics Clinic + Weather Clinic + Safety at Sea Clinic + a minimum of 50 qualifying days on the water (Level III). At any time, the software will give you an indication of how you are progressing. A day out on the water is counted as a minimum of 4 hours underway. For level advancement, at least 50% of a student's time must have been logged as master of the vessel and 50% of a student's time must be on a vessel greater than 20 ft (6m) for Skipper Small Keelboat, 25 ft (7.6m) for Skipper and 28 ft (8.4 m) for Bareboat Charter Master. See our FAQ NauticEd Sailing Certificate to further understand qualifying days. Bareboat Yacht Charter Companies are most interested in those sailing resumes displaying the rank of NauticEd Bareboat Charter Master Level III. This rank and level demonstrates to the charter company that the sailor has an acceptable amount of theory study and practical on-the-water experience. 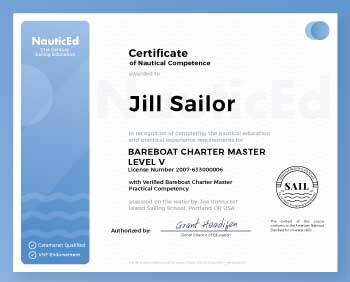 While some other certifying bodies award a student with a bareboat certificate, the amount of practical experience is too little to really qualify for a charter. Charter companies know this and will not immediately accept those certificates. 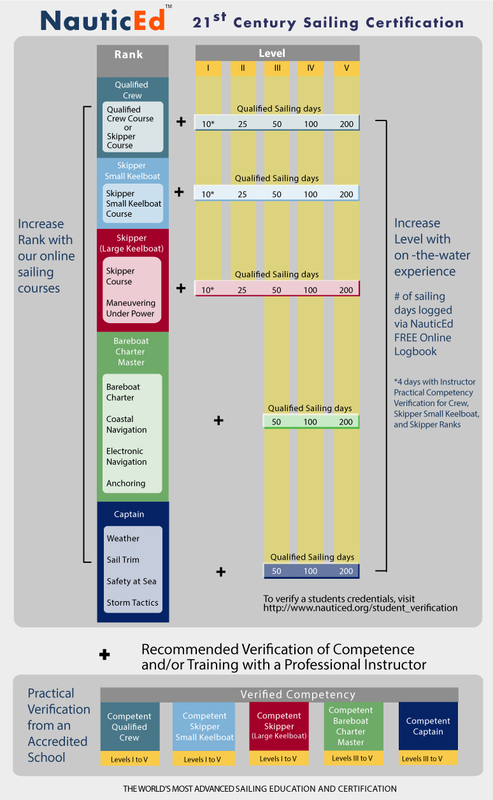 The infographic below illustrate how the Ranks and Levels work together to give a combined competency rating of the NauticEd student. Download a PDF of the above sailing Rank and Level plan. At NauticEd we recognize you for your diligence and hard work with certifications. Once you reach milestones in your sailing resume, our software automatically generates a sailing certificate that you can download and display. The NauticEd sailing certificate is a living document that morphs over time as you pass online courses, as you log on-the-water experience, and as instructors sign off your assessments to higher competence levels. Unlike other sailing certifications, you'll notice immediately that our sailing certifications are a true and real-time reflection of your resume and thus your competence. Get started building your sailing resume today by beginning with 2 free sailing courses: Basic Sail Trim and Navigation Rules and then try out our free electronic Logbook.